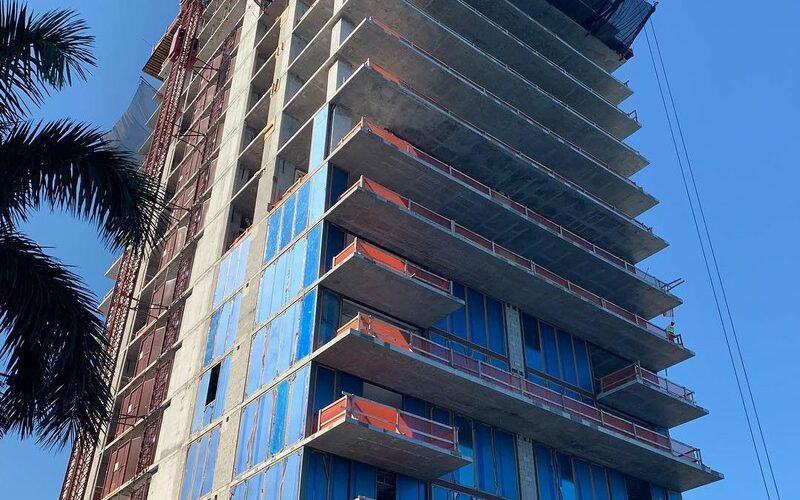 Contractors have poured the 18th floor at the Elysee Miami condo tower, which is set to become among the tallest in Edgewater and all of Miami. Douglas Elliman Development Marketing was recently tapped to to handle sales and marketing at the project, replacing Cervera. Nearly 50 percent of the project’s 98 units have now been sold, the developers said. A 5,500 square foot sales gallery for Elysee will soon open in the nearby Biscayne Beach Residences tower, which was also built by the same developer. Opening is set for February. Upon completion of Elysee, The space will be converted into a high end restaurant. When complete in 2020, Elysee will top off at 57 stories or 648 feet. That is the maximum height permitted in the Edgewater area by FAA rules. Bernardo Fort-Brescia of Arquitectonica designed Elysee with a three-tiered telescoping shape. Interiors are by Paris-based designer Jean-Louis Deniot.